Japan's Finance Minister Shoichi Nakagawa showed up at the G7 meeting in Rome totally blotto earlier this month. This calls for a cell phone game. 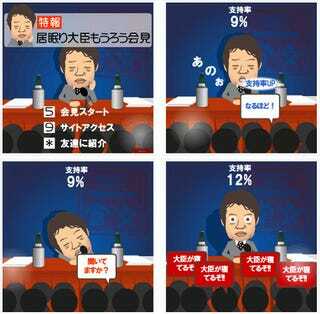 Cell phone start-up Liveware released a cell phone game in which the object is to keep Nakagawa awake during the press conference. Players must "poke" him with the 5 key at the right time to get him to respond to questions from reporters. His approval ratings are tracked at the top of the screen, and the object is to keep them from hitting zero. Fifteen minutes after the real Nakagawa finished the now infamous G7 press conference, he visited the Vatican Museum on Japanese tax payers' dime and touched various exhibits. He even climbed over the barrier for statue Laocoon and then sat on the exhibit as the alarm was sounded. He has since resigned as Finance Minister.